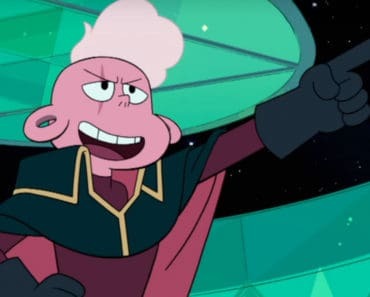 Cartoon Network just ended Adventure Time‘s most recent season with a week-long string of new episodes, and just two weeks later, they’ve revamped Steven Universe and employ the same strategy with a whole week of new episodes. Steven Universe has become a bit of an internet phenomenon. 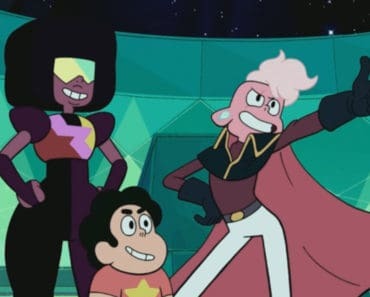 The show focuses on Steven, a young half-human, half-gem boy who lives with his three alien stepmothers. Steven faces challenges and seeks to conquer his insecurities while also defending the world from alien attacks. It’s a beautifully illustrated show with a strong heart, and it pairs perfectly with Adventure Time. 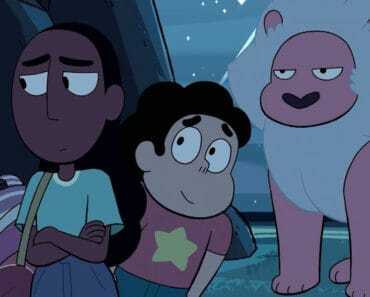 The first episode this week featured Connie, which was a sign that all of these episodes would be fun. “Sworn to the Sword” addresses the problematic nature of sacrificing yourself for another. 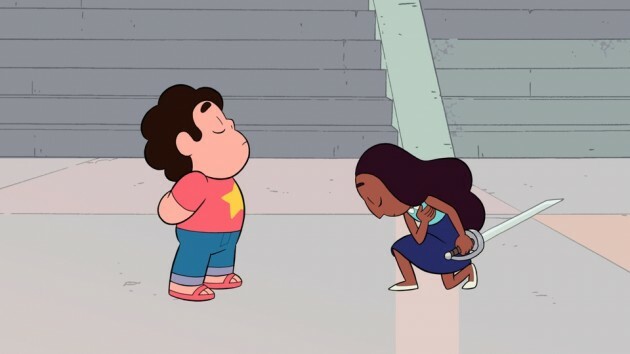 Connie asks Pearl to train her in sword fighting so she can help fight alongside Steven in battles. There’s a nice song at the beginning that reinforces Connie and Steven’s connection called “Share This Jam With Me.” Pearl uses Holo-Pearl to train Connie (and the last time we saw her, it ended badly), and we learn a little more about Pearl’s obsession with Rose-Quartz (Steven’s mother). Connie and Pearl sing a song called “Do It for Her/Him,” but the tone becomes dark when Pearl reminds Connie that “you don’t matter.” Steven, obviously concerned, asks Garnet and Amethyst for advice. Sure enough, Garnet tells him that Pearl has always been this way, and has often sacrificed herself as often as possible during the war. In the end, Steven reminds Connie that she wanted to fight alongside him, and not for him. They team up and defeat Pearl, proving that working as a team is better than sacrificing themselves. “Sworn to the Sword” reinforced that Pearl was very in love with Rose, but it does not build that further. I’d like to see more of what Rose’s interpretation of that love is like. 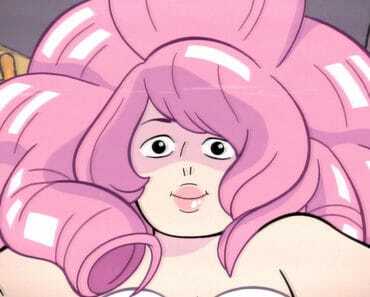 I would also love to see Steven address the fact that Pearl clearly wishes Rose was still around. These themes are dark for a kid’s show, but Steven Universe handles them so well. The next episode was “Rising Tides, Crashing Skies,” which I did not like as much, but I could appreciate it. 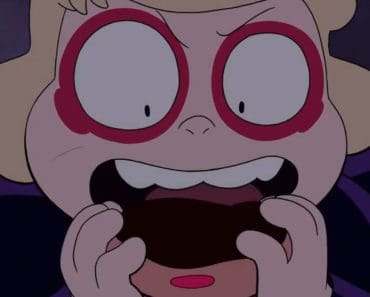 The episode followed Ronaldo as he tried to prove that the Crystal Gems were a danger to Beach City. Of course, he discovers that even though the Gems bring a lot of danger, they also keep the danger from affecting the citizens. Then there was “Keeping It Together,” and boy, what an episode. The Crystal Gems return to the Kindergarten to search for Peridot. They find her coming up from an underground area, and Pearl and Amethyst chase her. Garnet and Steve decide to explore exactly what Peridot was doing underground. Earlier on in the episode, Steven gets hung up on asking Garnet questions about being a fusion all of the time. Garnet brushes off the question, and the mission turns dark when Steven and Garnet find the broken remains of deceased gems fused together. The sight clearly traumatizes Garnet, and she almost comes totally undone. Her anger keeps her together, and she destroys the creature and safely sends the broken gems away. Later, Garnet explains that fusion is a choice, and the gems Peridot fused were resting at peace, and had no say in the fusion. Garnet draws a clear line between consent and force, and I can appreciate that message on a kids show. A solid episode, overall. 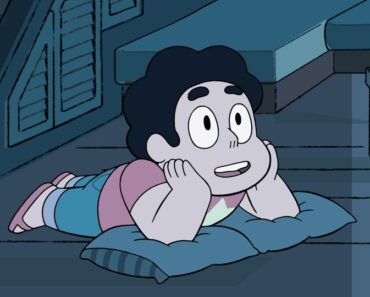 The Steven Universe week continues to pour out heartfelt, meaningful episodes, which is a great sign for the continuation of the show. We shouldn’t forget the awesome new intro song, either! Steven Universe has a knack for building consistent plots that create great tension within the show. Honestly, it accomplishes this much better than Adventure Time, and the world building is much less vague, which probably encourages people to keep watching and learn more. I’m excited to see the remaining two episodes this week, and to see where the rest of the season takes the group. Steven Universe: Did Rose Tell The Gems?